When you first arrive in Chiang Mai it can be a little overwhelming as to which yoga studio to go to for which style of yoga. 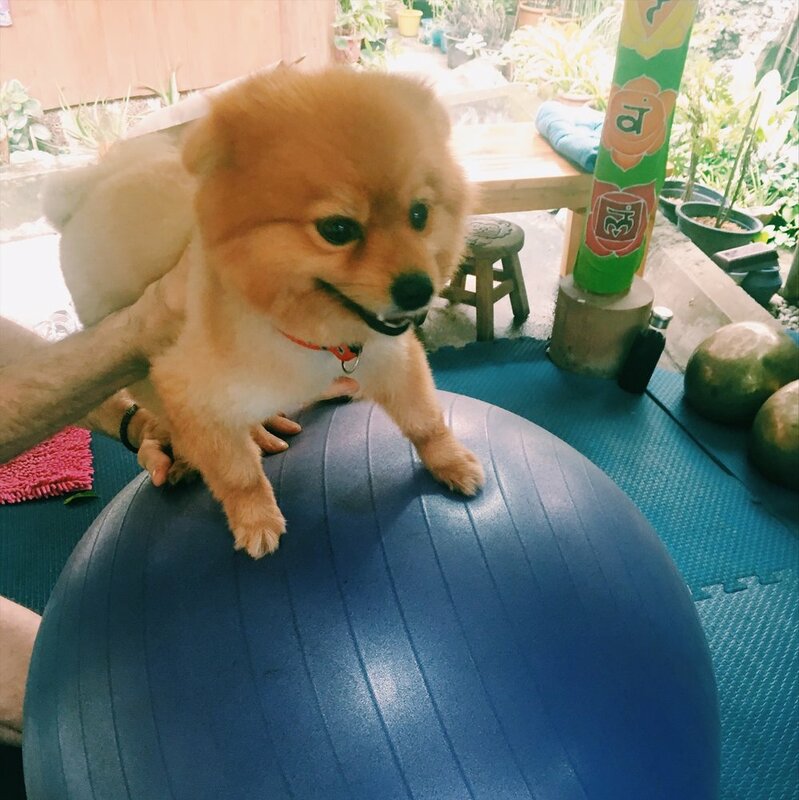 That's why I have taken it upon myself to attend classes all over the city, so I can give you the lowdown on exactly where to find the best yoga in Chiang Mai. There are two Ananda studios in Chiang Mai, one larger studio a little further out in Jing Jai and one smaller but centrally located studio in Nimman, my visit was to the the Nimman studio. I went to an excellent Ashtanga Vinyasa class with teacher and owner, Kru Nok. People looking to deepen their Ashtanga practice, but find the full LED classes difficult would likely benefit here. Ananda offers classes to suit every level, from stretching, core, vinyasa, Hatha to Ashtanga vinyasa and Ashtanga LED classes. The teacher, Nok completed her Hatha and Ashtanga yoga teacher training in ashrams all over India. Her love of yoga began when she was suffering from depression herself and she now loves to share her knowledge and also treats others with similar problems through her group classes, private classes as well as running a number of workshops and 200 HR Yoga Teacher Training. I have to say that it was a pleasure being taught by Nok and was clear on the first class that she loves what she does whilst being great at it! Check out the website for more details on YTT, workshops and events with Kru Nok. By far the most beautiful studio I have been to in Chiang Mai and set in a traditional teak house down a small lane in the south-east corner of the Old Town. I joined a fairly fast paced vinyasa flow class, be prepared to chatarunga!! Wild Rose caters for the more seasoned yogis + yoginis with offerings such as Vinyasa flow, Lunar flow, Yin Yang fusion, Hatha alignment flow and on Sundays Karma Yoga flow where 50% of the class cost will go to yogaamour.org projects, which support hill tribe children in Northern Thailand. One of my favourite yoga studios in Chiang Mai is Satva Yoga. Located in Satitham and run by husband and wife duo Nit + Freddy, this is the place to go for Iyengar and Aerial yoga in Chiang Mai. Although not heavy on the spiritual side of yoga, Satva's daily morning Iyengar classes help you work on your alignment and teach you how to perfect each asana with the help of props. An excellent class for beginners and intermediate yogis + yoginis alike. I had so much fun at the Aerial yoga class I joined. Nit will work with you closely to ensure you are moving into to each posture correctly and how fun to fly in the hammocks and hang upside down! Loved it. Booking is essential as spaces are limited for Aerial yoga. Also be careful not to fall in love with their dog named Happy (shortened from Happy Birthday), who absolutely lives up to his name. It's worth going even just to meet him. I felt very lucky to find this place. This is the place to go for authentic Ashtanga yoga. You won’t find many farangs in this class and you will need to contact Nui on FB to book as she will post available class times weekly and spaces are limited. I went to the full LED class and nearly died. It is a FULL LED class with no jump through spared. Excellent for experienced Ashtangis and for more aspiring yogis + yoginis, Nui’s mysore classes are designed for Nui to be able to help you master each asana from the primary series. You can work up to which ever point in the series you want to and she is on hand to give you her expert advice. Nui has been practicing yoga for over 9 years, she studied under many great Ashtanga teachers including Matthew Sweeny (who studied directly with Pattabhi Jois) and she now finds her passion in helping students to develop their own self practice. Request to join the Facebook group and contact Nui to book. Yoga Cottage is a bit of a trek outside the city, 30 mins in an Uber. But worth the trip for the idealic setting, huge yoga space and chance to mingle with the Chiang Mai local yogis + yoginis. This is where they all go to practice and on 6am every Saturday they have a free class where aspiring teachers have the opportunity to teach a class. They also offer Hatha, vinyasa, modifed Ashtanga primary, Sivananda yoga and Rocket yoga. 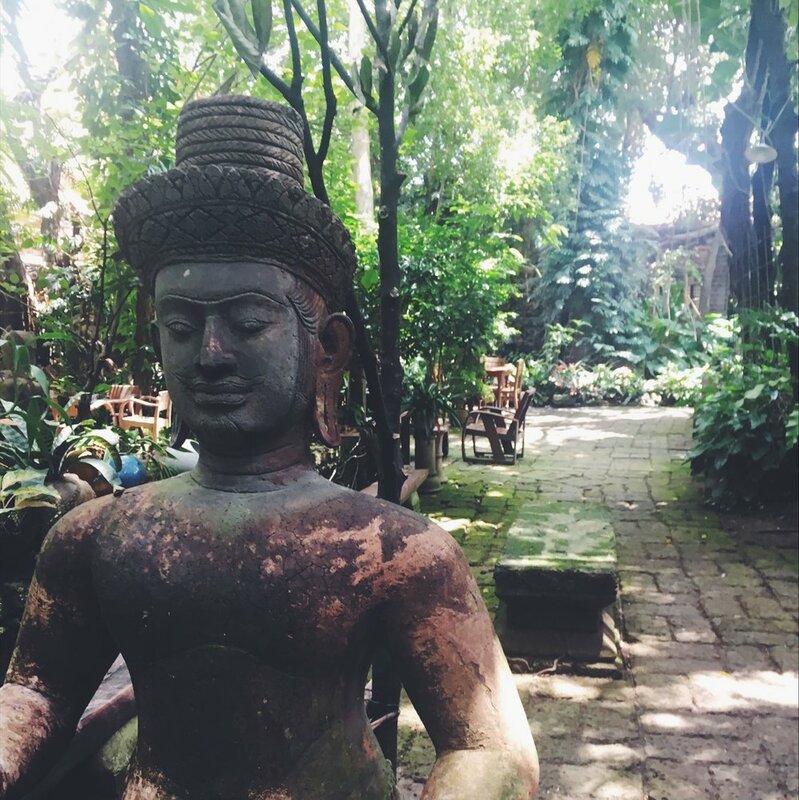 Located on the south-west side of the Old town, The Yoga Tree is a peaceful studio space surrounded by leafy greenery. They offer a vibrant program of classes including Hatha yoga, transformational dance, movement meditation, qi-gong and creative wellness workshop. I joined UK teacher Neil Jefferson’s Sunday Hatha Alignment class from 10am – 12pm. Neil’s class was perfectly paced for a Sunday morning and he began with some pranayama and welcomed info on yoga philosophy to begin. Check out Neil’s website for info on his retreats and events. 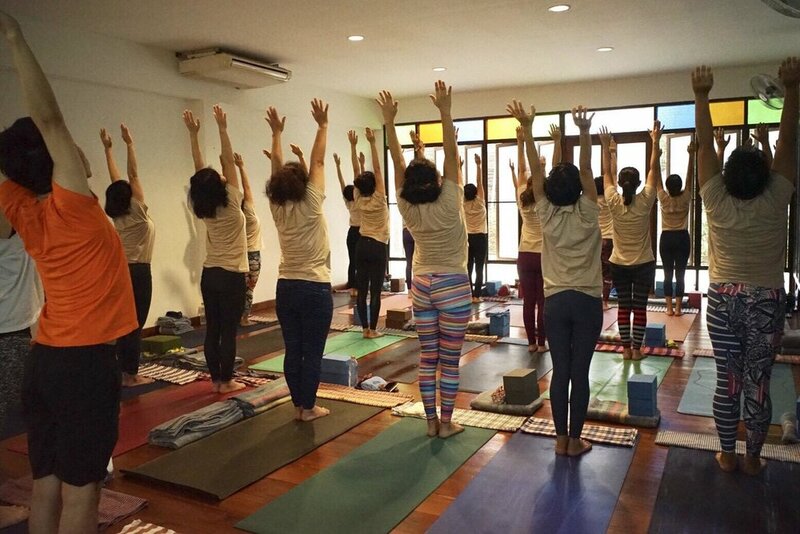 As well as Hatha and the classes mentioned above, The Yoga Tree is the only place in Chiang Mai that offers Dance Mandala classes and teacher training, a form of movement meditation and ecstatic free-form dancing. Another beautiful studio in traditional teak, Freedom is just east of the old town and run by Aussie owner Adam. Freedom offers Hatha, Vinyasa, mixed flow and Yin classes. The Thai teacher was clear and concise and gave a traditional Hatha class with Kapalbhati pranayama. She was particularly good at instructing the beginners in the class. They also offer a 2 day beginners workshop for yoga newbies as well as Vinyasa and Yin classes and other workshops and events you can find here. Stay around afterwards and try the avocado and poached eggs on toast from the café and the watermelon juice is just what you need after getting all sweaty and bendy. This was a new experience for me to try Tantra yoga. It was refreshing to go to a class where the students are taught beyond just asana and after the class the teacher, Blandine ran through the intro to the 8 limbs of Ashtanga. The emphasis is on awareness and expansion of consciousness, which is what the path of Tantra is all about. It is an on-going course, Mahassidha is also part of a world-wide network of yoga schools that teach the same curriculum so one can either do the first 3 course years in chiang mai and then continue at the same level in London or Copenhagen or Berlin or Las Vegas. The teaching offers a deeper understanding of the different levels of the being and how they operate together. As the curriculum unfolds they touch on more and more complex subjects and dive deeper into a variety of traditions such as Hatha Yoga, Mantra Yoga, Laya Yoga, Raja Yoga, Jnana Yoga, Tantric Buddhism, Tibetan Tantra, Svara Yoga, Maha Vidya Yoga and the study of the according spiritual texts and their interpretations. Mahassidha offer weekly yoga classes where you can drop in to the course on Monday and Tuesdays and there is a free class every Sunday at 5.30pm as an intro into Tantra Yoga. They also offer a number of retreats such as the 5 Day Tantra Yoga & Emotional Healing Retreat and the Tantra Yoga & Meditation Retreat: Journey Through the 7 Chakras. You can see all their up-to-date events, workshops and retreats on their Facebook page. Bodhi Tree are currently on the hunt for a new teacher but their usual offerings are daily classes, morning and evening. I stumbled upon this place by chance when I was going for a stroll around my local hood in Satitham and it ended up being one of my favourite classes I’ve been to here. Even though it was spoken nearly entirely in Thai it was the most fun class I've been to in CM. And all at 150BTH per class – what is not to love?